The author of It’s Okay to Laugh and host of the popular podcast Terrible, Thanks for Asking—interviews that are “a gift to be able to listen [to]” (New York Times)—returns with more hilarious meditations on her messy, wonderful, bittersweet, and unconventional life. Life has a million different ways to kick you right in the chops. We lose love, lose jobs, lose our sense of The author of It’s Okay to Laugh and host of the popular podcast Terrible, Thanks for Asking—interviews that are “a gift to be able to listen [to]” (New York Times)—returns with more hilarious meditations on her messy, wonderful, bittersweet, and unconventional life. But in the wake of loss, we get to assemble something new from whatever is left behind. Some circles call finding happiness after loss “Chapter 2”—the continuation of something else. Today, Nora is remarried and mothers four children aged 16 months to 16 years. While her new circumstances bring her extraordinary joy, they are also tinged with sadness over the loved ones she’s lost. Life has made Nora a reluctant expert in hard conversations. On her wildly popular podcast, she talks about painful experiences we inevitably face, and exposes the absurdity of the question “how are you?” that people often ask when we’re coping with the aftermath of emotional catastrophe. She knows intimately that when your life falls apart, there’s a mad rush to be okay—to find a silver lining, to get to the happy ending. In this, her second memoir, Nora offers a tragicomic exploration of the tension between finding happiness and holding space for the unhappy experiences that have shaped us. To ask other readers questions about No Happy Endings, please sign up. Life has a way of knocking you to your knees, dusting off, and going another merry go round. How you choose to enter the arena is your choice but the exit may not be what you hoped but in some ways was exactly what you needed. Look nobody enjoys having to say goodbye. Our lives are on a time clock as I truly believe everything happens for a reason. Some wonder if the person who is about to pass knows as in my case with my niece at 12yo when she gave a friend a heart cryi Nevertheless She Persisted! Some wonder if the person who is about to pass knows as in my case with my niece at 12yo when she gave a friend a heart crying with tears and a few days later passed away in a car accident. I do wonder but I also know those that pass are with loved ones and so I hope they are comfortable and enjoying the hell out of themselves. Nora is a woman I'd love to meet because she truly has had her share of experiences both good and bad. It's often said we envy those who have more and I honestly envy the love she shared with her spouse before he died. "He spent the last 4 years of his life finding ways to make me smile." Aaron was always considering me -keeping me top of mind. How could you regret this experience, this shared emotion, this LOVE! I could only dream of such a blessing from above. While I have three gorgeous kids I married a man who was a womanizer, multiple affairs, love children given up for adoption hidden from me his wife of 11 yrs. Having been left bankrupt, homeless, and long term unemployed with a med disabled son and three high risk pregnancies and now living in extreme poverty I can't fathom the same experience of Nora. However what I can relate too was the putting yourself back out there and dusting off to try again. Whether or not I'd ever remarry is probably not likely unless he's really special but that's a choice we all can make. I love the idea of her new found feminism and how she mentioned herself as "self sufficient machine"
So many feel they need to be in relationships to be somebody. This book is exactly what I needed. It's sad---heartbreakingly so---in parts. But it's also hopeful and warm, and it's so, so funny. Nora is my imaginary best friend, and she's very real in this. There are a lot of emotions (not all of them sad ones although obviously when you lose a baby, your dad and your husband in back to back losses, there are plenty of sad ones) and we feel them all with her. I believe this will be on a lot of Best Of lists this year and it deserves its space on all of them This book is exactly what I needed. It's sad---heartbreakingly so---in parts. But it's also hopeful and warm, and it's so, so funny. I believe this will be on a lot of Best Of lists this year and it deserves its space on all of them. I love everything Nora has to say. I could listen to her tell her stories of love and loss all day long. I love her sense of humor, and think her resilience is amazing, so my rating of this book doesn't reflect how I feel about the material as a whole. I just felt that several of the chapters were somewhat repetitive, and could have been condensed into one chapter, or perhaps more focused. I still appreciated reading this follow up to her first book, however, and think she's a wonderful writer. I always hate reviewing a memoir since it feels wrong. I love love love her podcast & I feel like I know her a little from listening to all the episodes. While reading this book it was her voice I could hear reading it. Some of these stories I already knew from her podcast. I love her style & personality. And I don’t know why it bugs me so much but I really want to know what Baby’s name is!! Can’t wait to meet her in a few weeks!! One of my guilty pleasures is watching the latest season of The Bachelor and The Bachelorette. Rachel Lindsay, one of the former Bachelorettes, always used this line with her guys - and it was about being honest and open with her..."keep it 100." I think that is why I am such a big fan of Nora McInerny - she keeps it 100. It takes a lot of courage and strength to throw your most vulnerable thoughts and feelings out into the world, but that's what she has done with No Happy Endings. Her words are One of my guilty pleasures is watching the latest season of The Bachelor and The Bachelorette. Rachel Lindsay, one of the former Bachelorettes, always used this line with her guys - and it was about being honest and open with her..."keep it 100." I think that is why I am such a big fan of Nora McInerny - she keeps it 100. It takes a lot of courage and strength to throw your most vulnerable thoughts and feelings out into the world, but that's what she has done with No Happy Endings. Her words are beautiful and thoughtful, sometimes funny, sometimes heart-wrenching. One of the most important lessons I took is that feelings are not mutually exclusive. Feeling happy about something does not negate your ability to feel sad about another thing. Loving one person does not erase your ability to give love to others. I’ve followed Nora for a long time, and I liked her first book, and I listen to her podcast, so I was probably always going to like this book. But I *loved* this book. Nora’s essays are crisp, and funny, and sad, and honest. And her footnotes are gold. Yes, this book deals in some heavy stuff. Read it still. Hell, read it because it deals in heavy stuff, and as Nora points out, none of us gets out of a full life without it. This book made a direct, immediate impact on my life. Not because I've had any major losses specifically but I got the message that life is short and you should tell people you love them when you feel it. You should tell them you're glad you found them. She's witty, smart, transparent, vulnerable, all in a very digestible way. I'm sorry she had to experience such loss to share her light so publicly but we're all lucky to see it. Loved it. Lots of wisdom and humor here. Nora puts words to things I've felt and I love the experience of reading, but feeling like she's talking to me. Way to go Nora. This is awesome. Nora McInerny is a genius. A very extremely enjoyable memoir about very extremely difficult situations. I think that Nora and I have a similar sense of humor because the story about Matthew's chair the night she met him made me cry laughing. Do yourself the favor and read this. It’s funny, it’s honest, it’s candid, it’s raw. Nora has a way with words that will make you laugh and cry in the same breath. Brilliant book! I just texted my current husband saying, “It’s affirming to read another woman’s story that so closely parallels mine”. 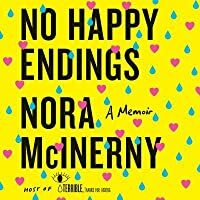 In No Happy Endings Nora McInerny continues telling us her story started in her book, It’s OK to Laugh (Crying is OK too). I quickly realized after starting the first memoir that I’d need my trusty underlining pencil that I use to say “YES! Me too!” Similar to the way I use the highlighting tool on my kindle. I also secretly hope that whoever reads the book after me will someho I just texted my current husband saying, “It’s affirming to read another woman’s story that so closely parallels mine”. 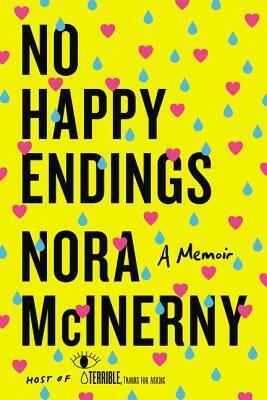 In No Happy Endings Nora McInerny continues telling us her story started in her book, It’s OK to Laugh (Crying is OK too). I quickly realized after starting the first memoir that I’d need my trusty underlining pencil that I use to say “YES! Me too!” Similar to the way I use the highlighting tool on my kindle. I also secretly hope that whoever reads the book after me will somehow understand me better for my having pointed out to them the secrets of my thoughts and subsequent actions. So, picking up No Happy Endings meant picking up my pencil again. I also texted my first son today and took a picture of a passage I thought he’d relate too. It says, “ Your nearly five year old heart knows that Matty Daddy isn’t a replacement for Papa Aaron. They exist in the same family. Both have a huge impact on who you are.” And to my current husband I similarly texted this passage: “People always imply that being with me must be hard for Matthew. They start out with a weird compliment like ‘he’s a saint ... he’s such a good guy’ and segue quickly into the casual ‘so ... how does he deal with it?’ It being my dead husband” “Matthew by the way is a saint and he is a good guy, but not because he dared to enter a relationship with me. He’s a good guy because he’s principled in everything he does. He loves me, and he loves Aaron. He has to love Aaron. Aaron is why he has me. Not just because Aaron died, although not having a living husband did make it easier to date Matthew. But because Aaron’s love and Aaron’s death creates the Nora I am right now.” You see, the secret that Nora and I both know is that it’s possible to love AGAIN and STILL. My marriage to John, like Nora’s to Aaron didn’t end because they died young men. We were both blessed to find love again and men who not only understand and accept that but who love us for it. Love for either husband does not disrespect the other. They exist together. So let me preface this review with the fact that I have never heard of the author, read her first book or listened to her podcast, Terrible, Thanks for Asking. I thought this book was hilarious and honest. Life is all about the ups and downs and she mentions several times throughout the book that you shouldn’t hide your real feelings in the hopes that someone else will feel better. You should be honest. If you want to cry, cry. If a song comes on that brings up a sad or happy memory, blast it an So let me preface this review with the fact that I have never heard of the author, read her first book or listened to her podcast, Terrible, Thanks for Asking. I thought this book was hilarious and honest. Life is all about the ups and downs and she mentions several times throughout the book that you shouldn’t hide your real feelings in the hopes that someone else will feel better. You should be honest. If you want to cry, cry. If a song comes on that brings up a sad or happy memory, blast it and let your loved ones know why that song means so much to you. She talks about how life unexpectedly goes on after heart break and loss. How you know that it goes on for everyone else, they have to get to their lives, but even for the person experiencing the loss. It is okay to love and want to be loved. It is a good thing actually, because then you are living your life. This woman lost her baby at 12 weeks, her dad and her husband within 6 weeks (I’m pretty sure that is what the book said!) I cannot even imagine this type of loss. Think of all the different emotions that would trigger from just one, now imagine 2 more. How completely overwhelming. When she starts to date again, she feels bad. When she falls in love, she is so confused and upset. This book honestly read (to me) as if she was giving herself a pep talk and I was sitting there listening, laughing at the right times, crying at the right times and nodding my head when I agreed. I absolutely loved how honest and real it was! As a newish mom, I also loved different ideas in the book to do with my husband and for my children. I loved this book. Nora McInerny is brilliant and real and talented with words. When she talked about anxiety, I thought me too! Postpartum stuff... Me too! The devestating discovery of Becky smoking in the bathroom at her wedding...me too! Her stories are relatable, entertaining, tear-jerkers. Reading Nora's words are like having a conversation with a friend while getting a hug. There is comfort in the uncomfortable because everyone is going to experience terrible things, but people forge on and I loved this book. Nora McInerny is brilliant and real and talented with words. When she talked about anxiety, I thought me too! Postpartum stuff... Me too! The devestating discovery of Becky smoking in the bathroom at her wedding...me too! Her stories are relatable, entertaining, tear-jerkers. Reading Nora's words are like having a conversation with a friend while getting a hug. There is comfort in the uncomfortable because everyone is going to experience terrible things, but people forge on and continue living life and evolve from these experiences. And talking about it, not ignoring it, is helping others learn how to deal with not only grief and devestating loss, but life in general too. I cannot tell you how much I appreciate Nora’s voice, her perspective, and her honesty. By voice I do mean the way she writes things, but also her literal voice because she’s one of the few podcasters I can handle listening to because she just sounds like a real person. This book provided more of that: realness. Authenticity. Whatever. It made me laugh out loud (in public). It made me cry (also in public). It made me think. And it helped me formulate new opinions. Nora’s work has impacted my li I cannot tell you how much I appreciate Nora’s voice, her perspective, and her honesty. By voice I do mean the way she writes things, but also her literal voice because she’s one of the few podcasters I can handle listening to because she just sounds like a real person. "'Are you pregnant?' This stranger didn't know that she had pushed me into a rabbit hole of shame with her question. She was giving me a chance to tell eveyone about my happy ending, about how the struggle and loss was all worth it. But that's oversimplifying the narrative. I couldn't talk about my happiness without touching the uncomfortable truth that everything I have now is built on everything I lost."